A large number of companies operate in the global tea market rendering it highly competitive. The primarily compete on the basis of product quality, service, brand image, innovation, price, and distribution. While the market exhibits presence of several prominent players such as Tata Global Beverages, Kusmi Tea, Davids Tea, and Unilever Plc. and Unilever Plc., small and medium-scale suppliers are also present in plenty, finds Transparency Market Research (TMR) in a new study. TMR pegs the global tea market to reach US$20.0 bn by the end of 2025, from US$12.8 bn in 2017. If these figures hold true, the global tea market will exhibit a CAGR of 5.7% between 2017 and 2025. Based on type, the demand for crush, tear, curl (CTC) tea is expected to remain considerably high through the course of the forecast period. Regionally, Asia Pacific emerged dominant in the global market. Between 2017 and 2025, the Asia Pacific tea market is likely to rise at a CAGR of 6.8%. As per TMR, the global tea market is likely to remain steady in the forthcoming years. The rising demand for tea around the world will enable the market to sustain growth through the forecast period. TMR finds that traditional tea will remain popular among tea lovers worldwide. Besides its cost-efficiency, the steadily increasing consumption of traditional tea will enable it secure a significant share in the global tea market. Meanwhile, the rising popularity of premium tea such as oolong tea, yellow tea, and white tea will create considerably growth opportunities for the market. The demand for premium tea varieties is expected to rise in the coming years and consumers’ willingness to spend increase in response to their increasing disposable income. The growing awareness about health benefits offered by tea will also push its demand worldwide. The flavonoids, antioxidants, and phytochemicals present in tea help improving various functions in human body. The rising knowledge about benefits of drinking tea for patients suffering from combat arthritis, cardiovascular diseases, and high blood pressure will pave way for the market’s growth in the coming years. In the coming years, the market is likely to gain significantly from the rising popularity of herbal and organic tea. Their infusion with a wide range of flavors and fragrances will also favor growth in the market. On the downside, change in consumer preference and fluctuating wages of labor may hinder the market’s growth. Also the increasing consumption of coffee will act as key restraint for the market. Other factors such as resource constraints and climate change may adverse impact the market. Nonetheless, tea consumption is forecast to rise around the world. 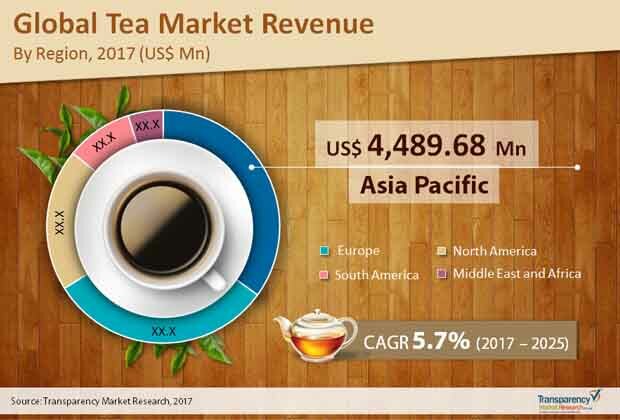 Furthermore, the increasing availability of various flavors and types of tea at a reasonable price will boost the market over the forecast period.